Learn more about how Mountain Medical Arts can help! At Mountain Medical Arts, PLLC, patients from the communities in and around Burnsville, North Carolina, receive expert medical care that combines the best of state-of-the-art traditional medicine and integrative therapies designed to enhance overall health and wellness at every stage of life. Led by Kelly Rothe, DO, and her husband, Jeffrey Polgar, MD, Mountain Medical Arts has evolved as a family practice to serve the needs of Yancey County. The team at Mountain Medical Arts is committed to improving and protecting the health of their patients and offer a comprehensive range of services. The medical team takes a holistic approach to wellness, considering the overall health of each patient instead of just their symptoms. Treatment is wholly customized, combining disease management, lifestyle advice, nutrition, and physical activity to promote optimal wellness. 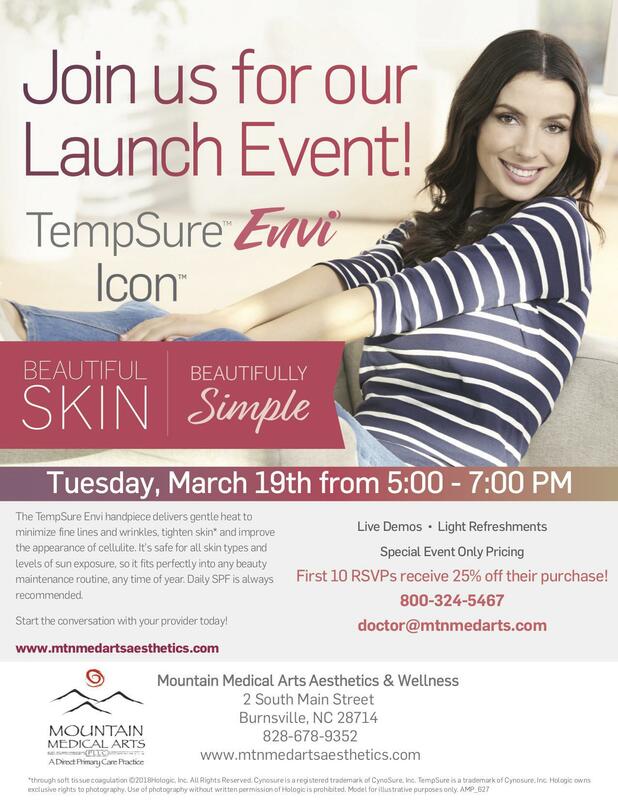 In addition to being a family practice, Mountain Medical Arts offers a variety of cutting-edge aesthetic treatments using Cynosure® laser equipment, including Icon® and TempSure™. Patients can reduce signs of aging, decrease cellulite, and even enjoy laser hair removal treatments. The team at Mountain Medical Arts also offers a comprehensive array of dermatology services, including skin exams, lesion removal, and biopsies. Mountain Medical Arts welcomes new patients and accepts most insurance plans. Appointments are available by calling the practice or using the convenient online booking feature. Visit our Primary Care practice! Financing available as low as $99/month for your aesthetic treatment!